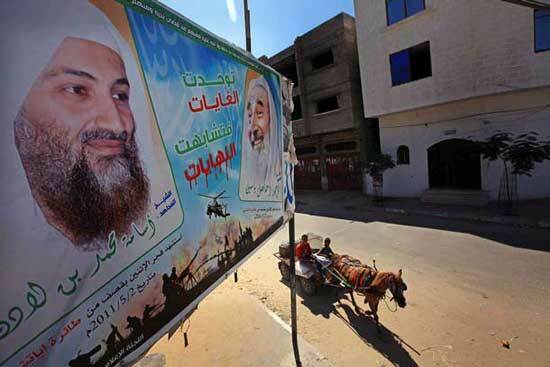 Poster distributed by the present Palestinian majority "party" Hamas venerating the Hamas founder Sheikh Ahmad Yassin, Al-Qaida leader Osama Bin Laden and three leading Chechen terrorists (CSS, Sep 2004). For the first time in the history, Hamas - the Palestinian branch of the Muslim Brotherhood and the ideological cousin of al-Qaeda - has gained full control over contiguous territory and population, and has now effectively become a state government without real opponents. 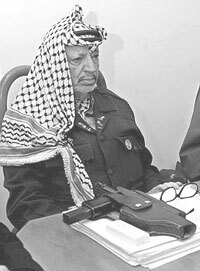 Bin Laden's inspiration: The late Palestinian "President" Yasser Arafat was the godfather of international terrorism. He dashed his people's hope for statehood, stole billions of dollars intended for the relief of their suffering, and indoctrinated their children with so much hatred that they willingly turned themselves into human bombs. Since 1965, Palestinians initiated acts of international terror like passenger jet hijackings, sea piracy, hostage ransoming, suicide bombings, murder of sportsmen and diplomats including one U.S. ambassador, random killings of Arab, Israeli, European, American civilians. The current global terror campaign was successfully introduced first by Palestinians against Jews and Israelis, as well as Lebanese Christians and dissenting Arabs. Today, the deliberate killings of Arab, Israeli, European, American civilians by Palestinian terrorists and their Islamist supporters are both widespread and systematic, and are perpetrated as part of a publicly announced policy to target civilians. For decades. the West tolerated and even rewarded terrorism. The Palestinians, not Bin Laden, first proved that terrorism does not delegitimize a cause but puts it on the map. It was this teaching that terror works that brought 9/11, and threatens more and larger 9/11s. Undoing this lesson is the primary challenge of our age. --His attack will be encouraged by the official Palestinian media and Palestinian Authority (PA) appointed and paid clerics in their sermons. --He will not be stopped by PA forces. --If he succeeds in killing Israelis, he will be praised by PA institutions, all Palestinian "political parties" of note, and the Palestinian media. --If he is captured or arrested by Israel, the PA will demand his release. --After an attack, he will not be arrested by the PA. In the unlikely situation--restricted to a few high-profile cases attracting Western pressure--he will only be placed under house arrest and allowed to "escape" soon. --If he is killed, the PA will make him an honored martyr. --Whatever he does, including the brutal murder of Israeli civilians and children, he will still be welcome to join the PA payroll as a security man. If as a member of the security services he commits a terror attack, he will not be fired. The Fate of Palestinian Moderates. Arafat's thugs don't murder only Jews (Wall Street Journal, Apr 20, 2002): "Palestinian militiamen shot dead two alleged collaborators with Israel on Thursday, then tied the body of one to the back of a pickup truck, dragged him through town and attempted to hang him from a rooftop overlooking the traditional birthplace of Christ ... During the uprising in the late 1980s, some 800 "collaborators" were murdered, many of them simply Palestinians who had prospered under Israeli occupation. After the 1993 Oslo accords gave him a statelet, Mr. Arafat quickly set about criminalizing "collaboration"--most famously with a law making the sale of land to Jews punishable by death. But those who get a trial are the lucky ones. Seven decades of "collaborator" killings have silenced or driven out many who would be open to coexistence with Israel.It's yet one more reason to believe there will never be peace so along as the dictator and his brownshirts run Gaza and the West Bank." Dead Body Dragged Through Bethlehem (Fox News, Mar 14, 2002): "BETHLEHEM, West Bank — Palestinian militiamen shot dead two alleged collaborators with Israel on Thursday, then tied the body of one to the back of a pickup truck, dragged him through town and attempted to hang him from a rooftop overlooking the traditional birthplace of Christ ... It was the second time in three days that suspected informers have been killed and their bodies shown off. About two dozen collaborators have been killed by Palestinian militiamen during the past 18 months of fighting." Article (1): Palestine is part of the Arab World, and the Palestinian people are part of the Arab Nation, and their struggle is part of its struggle. Article (6): UN projects, accords and resolutions , or those of any individual country which undermine the Palestinian people's right in their homeland are illegal and rejected. Article (17): Armed public revolution is the inevitable method to liberating Palestine. Article (19): Armed struggle is a strategy and not a tactic, and the Palestinian Arab People's armed revolution is a decisive factor in the liberation fight and in uprooting the Zionistexistence, and this struggle will not cease unless the Zionist state is demolished and Palestine is completely liberated. President Discusses Roadmap for Peace in the Middle East. Remarks by the U.S. President on the Middle East (Mar 14, 2003): "The Palestinian state must be a reformed and peaceful and democratic state that abandons forever the use of terror. ... And the Arabstates must oppose terrorism, support the emergence of a peaceful and democratic Palestine, and state clearly that they will live in peace with Israel." [Arafat's] Fatah committed to Aksa Martyrs (Khaled Abu Toameh, JP, Jun 20, 2004): The Palestinian Authority has no plans to dismantle the Aksa Martyrs Brigades, the armed wing of Fatah, Prime Minister Ahmed Qurei announced on Sunday. He acknowledged that the group is part of Fatah and said its gunmen are entitled to play a political role in the future. "We have clearly declared that the Aksa Martyrs Brigades are part of Fatah," Qurei said in an interview with the London-based Asharq al-Awsat newspaper. "We are committed to them and Fatah bears full responsibility for the group." Qurei said his top priority now is to safeguard the security of the Fatah gunmen who are wanted by Israel. He said they would be integrated into Fatah's institutions and would be paid salaries. " Destroying terrorists' homes works (JP, June 21, 2004): "... neighbors and family members of Palestinian would-be suicide bombers have often come forward with information to prevent the pending attacks, in an effort to spare their homes from demolition. Israel has come under harsh international criticism for demolishing homes of Palestinian suicide bombers." "The EU's relations with West Bank and Gaza Strip" (European Union Report 2000): "Palestinian foreign trade is presently heavily concentrated on Israel, with about 90% of imports coming from Israel, and about 80% of exports going to Israel. The most important other trading partners are Egypt, Jordan, the Gulf States and the Netherlands. Despite the conclusion of trade and co-operation agreements between the Palestinians and Jordan, Egypt, Saudi Arabia, as well as the European Union, the United States and others, which all provide for preferential access for Palestinian exports, there has been almost no geographical diversification of trade." This was in July 2000, before the start of Arafat's terror war against Israel in Sep 2000 trying to "kill Israel", the client which gave the Palestinians more than 80% of the business. Today it is easy to see that Arafat's terrorism ruined the whole Palestinian economy. The Arab/Muslim Nazi Connection (Christian Action for Israel, Apr/May 2000): "Hitler's Mein Kampf currently ranks sixth on the best-seller list among Palestinian Arabs. Luis Al-Haj, translator of the Arabic edition, writes glowingly in the preface about how Hitler's "ideology" and his "theories of nationalism, dictatorship and race… are advancing especially within our Arabic States." PALESTINIAN WOMEN AND CHILDREN IN THE THROES OF ISLAMIKAZE TERRORISM (Raphael Israeli): "The world often views Islam as a seventh century anachronism. But the truth is the Islamic world is playing and winning a sophisticated game of media manipulation in which powerful and wealthy police states and anti-democratic political movements are more often portrayed and perceived – at least in the context of the Arab-Jewish conflict – as victims rather than threatening oppressors. This paper will contrast what Islamic leaders say about their intentions for the state of Israel in English while western television cameras are rolling and what they say to their own constituents in Arabic." My new Muslim hero (Joseph Farah, WND, Nov 28, 2001): "... Zohair Hamdan, the muktar of the Jerusalem neighborhood of Sur Bahir, was gunned down by would-be assassins who fired nine rounds, hitting the Arab peace crusader with five. When Jerusalem's Arab neighborhoods were scheduled to fall under Palestinian Authority control under the peace plan of former Israeli Prime Minister Ehud Barak, Hamdan protested, saying he would prefer to remain under Israeli sovereignty rather than Arafat's. Courageously, Hamdan did something that is without precedent in the world of Arab politics. He launched a petition campaign, collecting more than 10,000 signatures of Jerusalem Arabs opposing Arafat's rule." Terror Stings Its Pal, the U.N. (Alan M. Dershowitz, professor of law at Harvard Law School, Los Angeles Times, Aug 28, 2003): "There are numerous occupied peoples around the world seeking statehood or national liberation, including the Tibetans, Kurds, Turkish Armenians and Palestinians. Only one of these groups has received official recognition by the U.N., including observer status and invitations to speak and participate in committee work. That group is the one that invented and perfected modern international terrorism — namely, the Palestinians. These rewards were first bestowed in the 1970s when the Palestine Liberation Organization was unabashedly committed to terrorism. In fact, Chairman Yasser Arafat was invited to speak to the U.N. General Assembly in 1974 at a time when his organization was seeking to destroy a member-state of the U.N. by terrorism. By rewarding Arafat and the PLO for such behavior, the U.N. made it clear that the best way to ensure that your cause is leapfrogged ahead of others is to adopt terrorism as your primary means of protest. The Tibetans, whose land has been occupied more brutally and for a longer period than the Palestinians, but who have never practiced terrorism, cannot even receive a hearing from the U.N."
Dealing with Hamas (Alan Dershowitz, professor at Harvard Law School, Globe and Mail, Sep 16, 2003): "... there can be absolutely no doubt of the legality of Israel's policy of targeting Hamas leaders for assassination. Hamas has declared war against Israel. All of its leaders are combatants, whether they wear military uniforms, suits or religious garb. There is no realistic distinction between the political and military wings of Hamas, any more than there is a distinction between the political and military wings of al-Qaeda. The official policy of Hamas, like that of al Qaeda, is the mass murder of civilians. The decision to employ that policy was made by its so-called "political" leaders. The United States properly targeted Osama bin Laden and his associates, as well as Saddam Hussein and his sons. Under international law, combatants are appropriate military targets until they surrender. They may be killed in their sleep, while preparing military actions or while participating in any other activity. They need not be arrested, or even given a chance to surrender. Only if they come out with their hands up, or waving a white flag, or affirmatively manifesting surrender by some other means, may they avoid the ultimate sanction of a war they started, namely death." Killing terrorist chieftains is legal (Alan Dershowitz, professor at Harvard Law School, JP, Apr 22, 2004): "it is proper to kill a combatant during an ongoing war unless he surrenders first. It doesn't matter whether the combatant is a cook or bomb-maker, a private or a general. Nor does it matter whether he wears an army uniform, a three-piece suit, or a kaffiyeh. So long as he is in the chain of command, he is an appropriate target, regardless of whether he is actually engaged in combat at the time he is killed or is fast asleep. Of course, his killing would be extrajudicial. Military attacks against combatants are not preceded by jury trials or judicial warrants. ... Reasonable people can disagree about whether the decision to target Yassin, Rantisi, Al-Sadr, Bin Laden, or any other terrorist is tactically wise or unwise, or whether it will have the effect of reducing or increasing the dangers to civilians. But no reasonable argument can be made that the decision to target these combatants - these terrorist commanders - is unlawful under the laws of war or under international law." The 'military solution' works (Evelyn Gordon, JP, Oct 7, 2003): "Far from proving a failure, the 'military solution' has proven its efficacy over the last year."